The beginning of the twentieth century is characterized in Russian art as the heyday of the genre still life. The exclusion of plot, and sometimes any connection between the objects depicted on one canvas, did not deprive the painting of meaning at all. Now the focus has shifted to color and shape. These two components clearly dictate their properties in the work of Pyotr Konchalovsky “Still Life”. 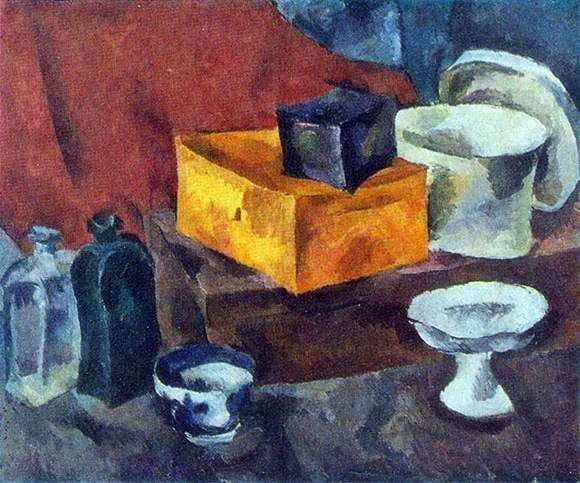 Among the many images of inanimate nature, the “Still Life” of 1911 is stylistically defined as a painting in the progressive direction of cubism. The largest object in the image is a large brown box, on which pyramidal square objects of yellow and blue color are located. Nearby is a white rounded box. Just below is a white drinking bowl painted with a blue pattern and an empty fruit bowl. Two damask from transparent and greenish glass are harmoniously placed on the left side of the picture. All this composition is located on the background of a dirty gray table and a rich tone of red folded matter. A typical work in the style of cubism is original, arising from its contemplation impressions. Glance captures not only the saturation of alternating colors, but also a certain severity, visual significance of objects. Square, round and bottle-shaped things are written in such a way that, looking at them, you feel the difference in their textures: the boxes are rough, the dishes are clearly ceramic, the bottles are ringing and fragile. Konchalovsky presents objects as a given, without communication with a person. Does not attract his attention and background space. Only the color sound and the feeling of texture are the essence of the painting “Still Life”. Having chosen ordinary, even at first sight unattractive objects for the audience, the artist insists on their simple but sure picturesque beauty.